TET1 is a methylcytosine dioxygenase that catalyzes the conversion of the modified genomic base 5-methylcytosine (5mC) into 5-hydroxymethylcytosine (5hmC). Methylation at the C5 position of cytosine bases is an epigenetic modification of the mammalian genome which plays an important role in transcriptional regulation. TET1 might initiate a process leading to cytosine demethylation through deamination into 5-hydroxymethyluracil (5hmU) and subsequent replacement by unmethylated cytosine by the base excision repair system. TET1 preferentially binds to CpG-rich sequences at promoters of both transcriptionally active and polycomb-repressed genes. By controlling the levels of 5mC and 5hmC at gene promoters, it may regulate the gene silencing induced by cytosine methylation. It has been shown that TET1 plays an important role in embryonic stem cells maintenance and regulating the balance between pluripotency and lineage commitment. Rabbit polyclonal antibodies were produced by immunizing animals with a GST-fusion protein containing the C-terminal region of human TET1. Antibodies were purified by affinity purification using immunogen. Fig 1. 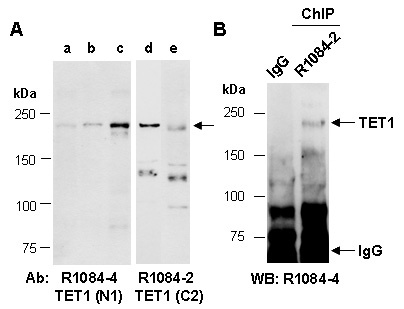 (A) Western blot of total cell extracts from a: human iPS; b: human Jurkat; c,d: mouse thymus; e: mouse fetal brain, using 2 independent Abs against 2 distinct regions of human TET1 at RT for 2 h. (B) Total extracts from human Jurkat were immunoprecipitated (IP) with IgG or anti-TET1 (C2) (R1084-2) under cross-linked chromatin immunoprecipitation (ChIP) conditions; followed by WB with anti-TET1 (N1) (R1084-4) at RT for 2 h.